This guide explains how to process payroll via API while also allowing to add payments, expenses and deductions to the payroll process. Processing payroll via API is very similar to processing payroll within Microkeeper. The key difference is Payments, Expenses and Deductions can be automatically added via the API when the process is triggered. This means all Shift rules, Rate rule, Extra rules, Deduction rules, super and leave will be applied as per normal. This gives the 3rd party app the flexibility to select which parts of the payroll process they would like to handle and which parts Microkeeper will take care of. Salary staff will be paid their standard salary without any payments sent via API. Ad hoc payruns are not available via API but can be run within Microkeeper if required. The API assumes Award Interpretation has taken place and just payment lines are being sent through. - The user can add amendments to the payslip. - The user can edit existing lines on the payslip. - If a payrun is processed again via API all the added lines will remain but the edited lines will be replaced. - If a payrun is processed again NOT via API all the lines that were added via API will be removed permanently. Super should not be sent as this will be calculated automatically based on the payments sent and classification of those payments. Leave accrual process is automated by Microkeeper based on the hours paid and the employee's entitlement settings. Leave can be paid out either through Microkeeper or as Payments sent via API. Use this example table to set the note variable if paying out leave. RDO and TIL are grouped in Microkeeper. The example above has the leave loading set to 17.5%. As long as the note starts with the string it will be picked up, the search filter is "Annual Leave%". Thus "Annual Leave" and "Annual Leave Job A" are treated the same. Only active staff are included in the payrun, meaning if no payments are sent for an Active employee a zero payslip will be created, which is fine. In contrast, if payments are sent for terminated staff then the API will return an error for the entire request, the terminated staff should be fixed before the payrun can be processed. Below is a list of variables that can be added to mk_data when adding payroll data. The end date is a run identifier, this lets Microkeeper know which payrun to process. For example, setting this value to YYYY-07-31 lets Microkeeper know it's the first month of the year, assuming monthly payroll is being processed. This value is set by Microkeeper, if the end_date falls within a week then that week will be selected regardless if the end_date matches the end_date in Microkeeper If the end_date Microkeeper sets doesn't match the end_date being sent then this is a configuration issue in Microkeeper. Review the Starting day of work setting in the Global settings. 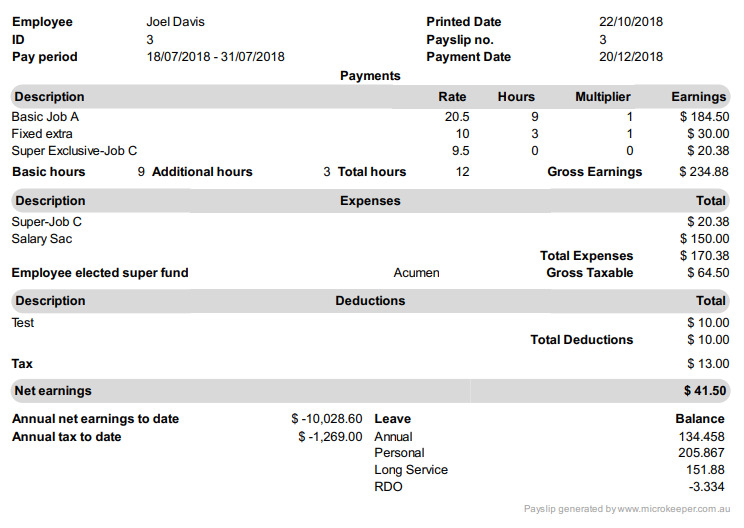 The payment date is used to determine which month and fiscal year this payrun will fall into, this is critical to calculate super and EOFY reports correctly. This is recommended for tax purposes. Not critical for a casual workforce. The fields below can only be set the first time a payrun is processed, thus if the command is run again and the values have changed, the original values will be used. If the payment date needs to be changed this can be done in Microkeeper. JSON and URI can cause issues with apostrophe quotes and amps, make sure to test. It's best practice to add loading here. For example, Casuals get a 25% loading, make 'mult' 1.25 rather than increase rate. Refer to the Payments Classification Chart to learn more. It is likely this option will not be required as it can be filled from the Employees Profile. If you do wish to fill this field refer to the STP guide. If the hours line is set to 0 or omitted then it's skipped when calculating the total. Bonus of $100, hours set to 0, mult set to 1, Thus total will be 100x1 = $100, not 100x0x1, which would = $0. This is important so entitlements are not accrued. When Jobs are added to Microkeeper they are assigned a unique ID number. A JID can be sent via API when adding payments. Mouseover the ID number and a JID will be displayed. The total for each line is rounded to 2 decimal places. When a payrun is successfully processed in Microkeeper a successful message will be returned. The message field could be displayed to the user as a confirmation. A total for payments, expenses and deductions will be returned, this could be used for validation to ensure the total sent equals the total returned. Note, the total on the payslip will likely not match the total sent as super and other payments might be added to the payslip, keep that in mind if the get_payroll API is called. The below example is what would be returned if the request example above was processed. All payroll data will be included via the date range supplied. Up to 365 days of data can be exported in a single request. Below is a list of variables that can be used to get payroll data. A request will include a list of payruns. Each payrun will include a list of Payslips. RDO or TIL leave balance as of this payrun, in hours. Note: RDO and TIL are stored in the same box in Microkeeper. This is an example of a single payrun with the single payslip created from the example above.